I'm writing this alone, from Charlie 2, one of the most active apartments on the hackfest. It feels quite weird to see it empty. It feels so strange that the week is over, I had so much fun, I learned so much and got to realize that the Gtk+ community has a big bunch of awesome guys. 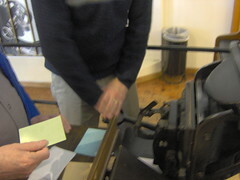 Today we went to the Deustches Technikmuseum Berlin, and the lots of fun there, specially in the printing room, where you could see our rockstars font rendering and cairo hackers playing with an 100 years old linotype to create our brand new, hand crafted business cards! I won't go into the details or the roadmaps, since all in all, this new cool plans and ideas has become a background issue for me, what really makes me feel like it was worth coming here, was the fact that I started feeling like those community guys were not a bunch of hackers for me anymore, but they're becoming something more close of a group of really good and awesome friends. 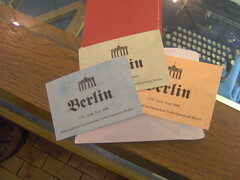 As for Berlin, I think it's a lovely city, actually quite bigger than Dublin and with more stuff to do in terms of fun, I wouldn't regret the opportunity to move there since most people speak english, and German doesn't seem that hard to learn once you know english. All in all, great fun. A big thank *YOU*, to all the guys there, for being such a bunch of smart and awesome people, and thank you to the GNOME Foundation and all the sponsors for being able to make this happen. I'm slowly going bed, since I have a flight tomorrow morning and I don't want to miss it. Back to Dublin, and in three weeks I'll be back at Spain for three months (yummy food!). PS: I would like to send a special thank you to Mathias Hasslemann for the huge effort on bringing us such a convinient venue and infrastructure for the Hackfest, and another big thank you to MacSlow, who spend most of his time there seting up the interviews which I think is a very important task to keep the community in touch even though kept him from doing some hacking.